We were delighted to welcome John Palethorpe, Area Business Manager for the British Board of Agrément, to our offices recently for the official presentation of our latest BBA Certificate. This certificate represents another successful round of BBA assessment for Rytons and will take us to 30 years of continuous approvals – a fantastic achievement no other manufacturer can claim for natural ventilation products. Rytons BBA Certificate (11/4866) covers Approvals for Rytons Slim Vent cavity ventilators, Rytweep and Retro Weep Vent weep hole ducts, Multifix Air Brick, Periscope sub-floor ventilator and range of Louvre and Hit & Miss ventilators. As the manufacture of these products is unregulated within the industry we believe the BBA’s robust testing procedure is important to give specifiers, local authorities, house builders, the NHBC and homeowners reassurance that the products are of a consistent good quality, will perform as advertised and will last the lifetime of the building. 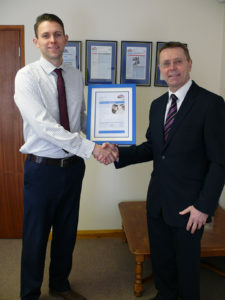 To find out more about Rytons BBA Approved products download a copy of Certificate 11/4866 here.